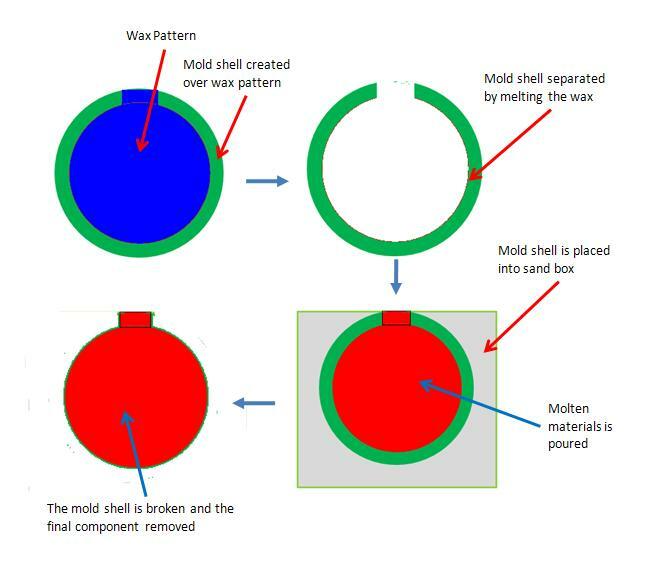 In investment casting process or lost wax casting process a wax pattern is used for creating a shell of refractory ceramic materials around it. The shell is created by dipping the wax pattern to slurry of refractory ceramic material and then allowing it to dry and set. The whole shell creation cycle is repeated several times until the thickness of the shell become 10-12mm. The wax inside the shell is drained up by applying heat. The shell is then placed inside a sand tub and molten metal are poured into it. Once the molten metal gets solidified, the shell is broken and the component is removed. – Materials required to produce the mold shell (refractory ceramic) is costly and non-recyclable. Ideal applications: Suitable for producing complex shaped small components like turbine blades, jewelries and for the components where the vacuum casting is required like reactive metal casting.